Anyone who follows my Instagram (@the_mcgills2015) knows my favourite pass time is cooking for my family and friends. And my most favourite time to cook for them is Sunday dinners, especially during Lent. After fasting all week it’s nice to sit down with loved ones and eat a nice warm dinner with a glass of wine. 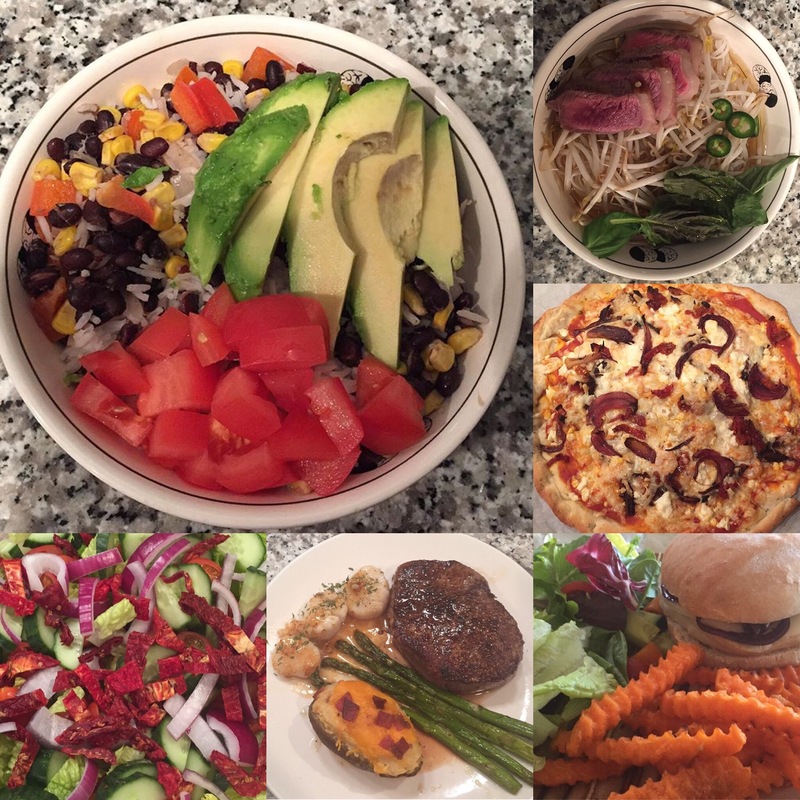 This is my first Sunday back at the office and after an exhausting week I still managed to pull together a yummy meal for us to enjoy. I know roast dinners can be beyond intimidating to many but really they are some of the simplest recipes in my artillery. There is no reason for someone who wants to cook a big Sunday shouldn’t be able to. Trust me, this is where I started cooking and my skills only grew from here. When starting to learn how to make Sunday roast your first and forever best friend is your grocery flyer and a well stocked pantry. I alway pick up which ever roast is on sale and because we have a deep freeze I usually pick up a few. It’s great when the roasting chickens are on for about $6 a piece, even if they aren’t very big you can make soup with the bones the next day or toss the carcass in the freezer for soup another day. My potato box in my pantry is always well stocked with root vegetables like turnip, onions, carrots, sweet potatoes and of course potatoes. This way I always have sides that are quick and easy and are yummiest when roasted. You next best friend is your slow cooker. 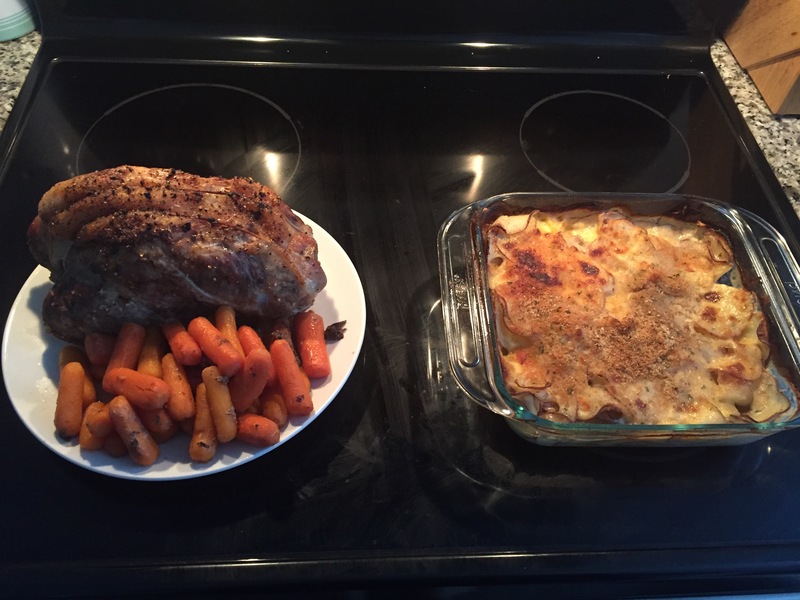 When I first started I would always make a roast beef with potatoes and carrots on Sundays for my roommate and I in university. First I would cover the roast in Montreal steak spice, place in the slow cooker and cover with potatoes, onions and carrots. I would turn it on low in the morning and by dinner we had a great meal to enjoy. This can be done with any roast you wish. If you don’t have a slow cooker the same can be done in the oven. For example the roast pictured above I made this week. I flavoured the pork shoulder with seasoned salt, placed it in the roasting pan added 1 cup of chicken stock and then added a few handfuls of carrots. Cooked it in a preheated oven at 300F for 2 1/2 hours. Quickly while I waited for the oven to heat I ran 4 potatoes through the spiralizer, made a quick cheese sauce and made quick and dirty potato scallop (recipe below) that I popped into the oven after about an hour. And my secret for nice an crispy on the outside and juicy on the inside roasts is no matter how you make them once they are cooked place them in a 475F oven for about 13-17 minutes (until nice and brown). Trust me everyone will think you are a pro! Use a spiralizer to slice the potatoes and arrange them evenly in a greased 8×8 baking dish. In a medium sauce pan melt butter. Once melted whisk in flour, when combined and thick whisk in milk. Allow milk mixture to come so a simmer then whisk in cheese until melted. Pour over potatoes. Speard bread crumbs and Parmesan cheese over the top of the potatoes and cover with foil. Bake at 300F along with the roast for the last 90 minutes. What is your quick and easy Sunday dinner trick? Let me know in the comments below! 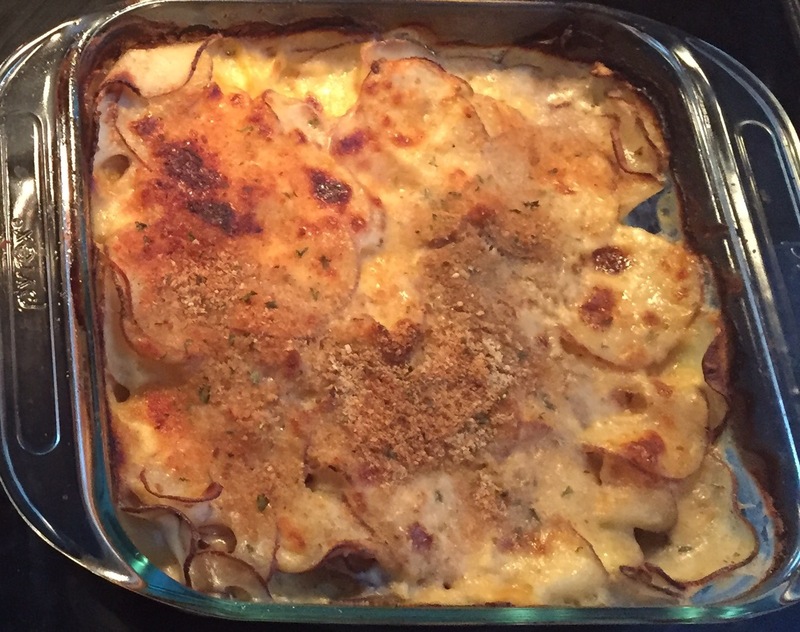 I love scalloped potatoes, and I just learned to make them last year from scratch. My husband is definitely a meat and potatoes kind of guy, so he loves them too. I am hoping that this recipe freezes well so I can get a big bag of potatoes and be set for Sunday dinners for a while this fall! Such a great meal… we do Lent too! Got to try this! I need new recipes…. I feel like I cook the same stuff all the time! I need to start cooking more often. i really enjoy mexican dishes and will surely be trying them more often. I couldn’t tell you the last time I had scalloped potatoes. They look so good!! Yum! Can I come over for dinner???!? It all looks so good! That gratin sound so easy and delicious!! Ummm those potatoes… OMG. NEEEEED.